Charlie and Matt DeVore’s story of embryo adoption after infertility started small but grew rapidly. It was first told by a local news station, but quickly spread across the country and finally to ABC News. The DeVores tried for eight long years to start their family naturally. Next they turned to infertility procedures and even traditional adoption, neither of which succeeded. Finally, the DeVores discovered the possibility of an embryo adoption through the Snowflakes Program. After a home study, applications and a match with a donor family, the DeVores transferred their adopted embryos into Charlie’s womb. Nine months later CJ was born. 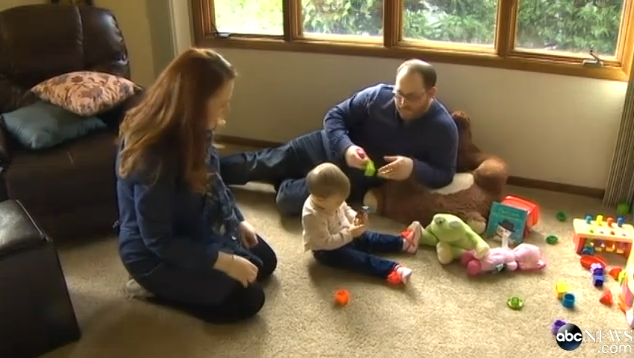 See the Devore’s full story by watching the ABC News story below.